The combination of training the new guy in a job I’ve only been doing for a month and a half, with having to move cubicles, with three separate IT disasters that prevent any work being done, with the preparation of tax returns, with losing a work baking contest to a boxed mix cheesecake bar, with the agreement to adapt your Master’s thesis for publication…these things can wear a girl out. It’s easy to cave and want to crawl into a hole and wait for it to all blow over. It would be nice to take a personal day, but temps can’t. So what do you do? You can make this. 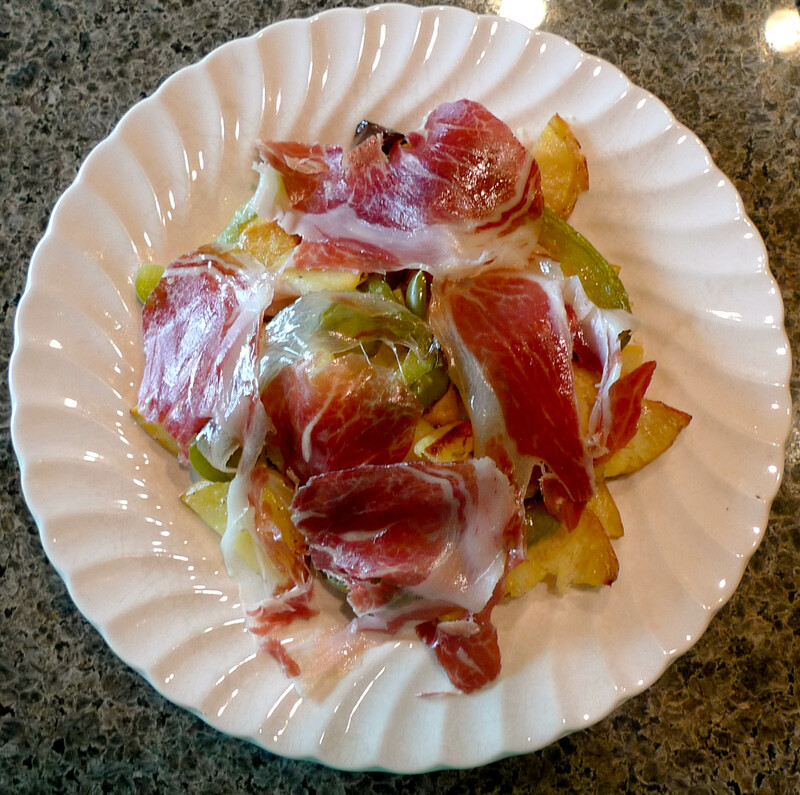 This is a dish that’s popular in jamón country in Spain. 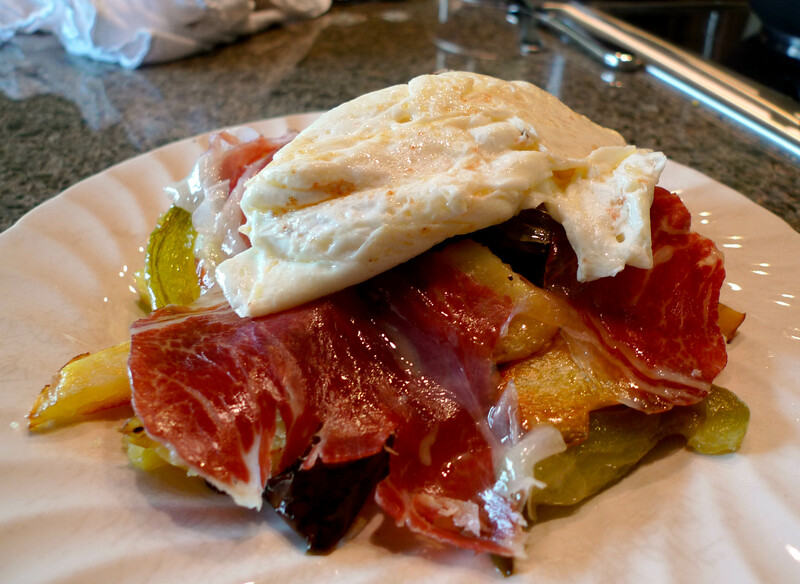 Huevos estrellados (Shattered Eggs) is a simple, rustic dish made up of fried potatoes, fried green peppers, slices of jamón, and a lightly fried egg. That’s a lot of fried. This is a hearty, comforting dish that can help smooth out the jagged edges of long, bad day. There is an unctuousness from the jamón and the liquid egg yolk that patches up the cracks life has put in you, but the simple comfy texture of the potatoes cuts it before it gets overwhelming. I’ve lightened it up by swapping out all the frying for roasting – it simplifies it so you can walk away and open up that beer. Cut the potatoes into half inch discs and halve them. I leave the skin on because I like it that way. Do what you will. Cut the bell pepper into half inch strips. 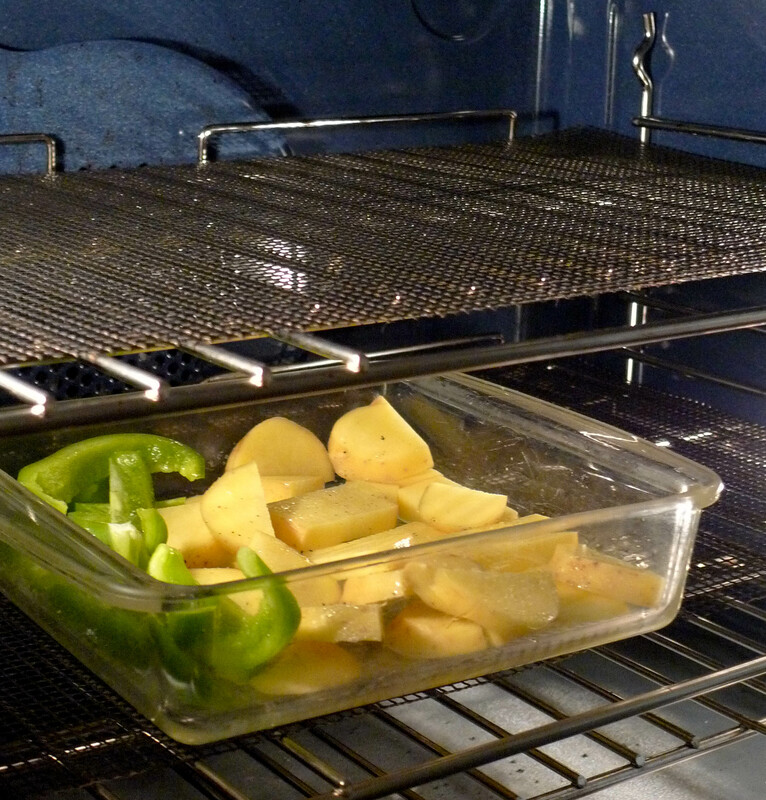 Toss the potatoes and peppers into olive oil into a greased casserole dish. Salt and pepper to taste. 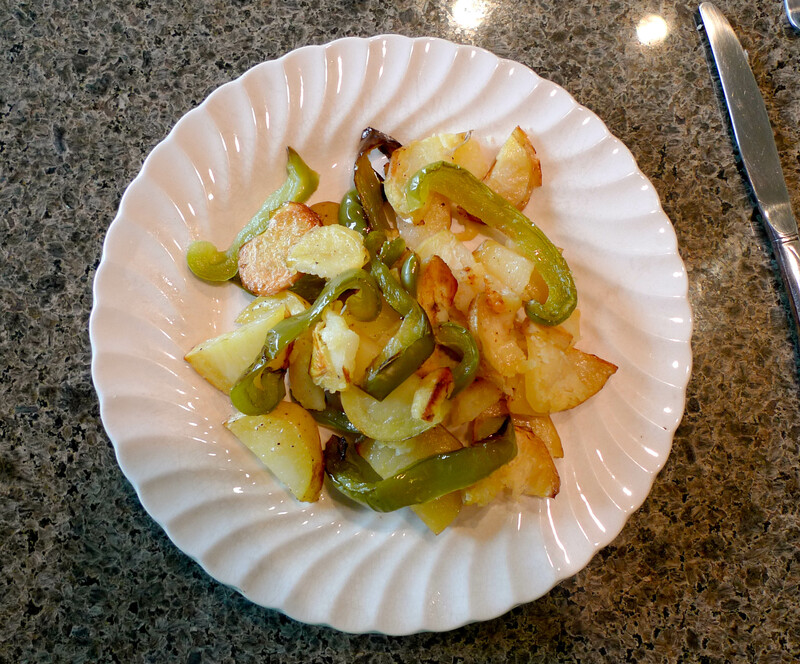 When your potatoes are soft and golden brown (about 20 minutes to half an hour), and your peppers are soft and slightly charred, pile ’em all on a plate. Layer your ham on top of the potatoes. It helps if you tear or cut it into smaller strips so you don’t have to fight with it later, when you are attempting to get a little bit of all the delicious flavors into your mouth at once. In a small frying pan, fry your egg or eggs until the whites are just fully set. Pile them on top of everything else, break the yolk and sit down. Take a deep breath. And eat your cares away. That’s what comfort food is for. 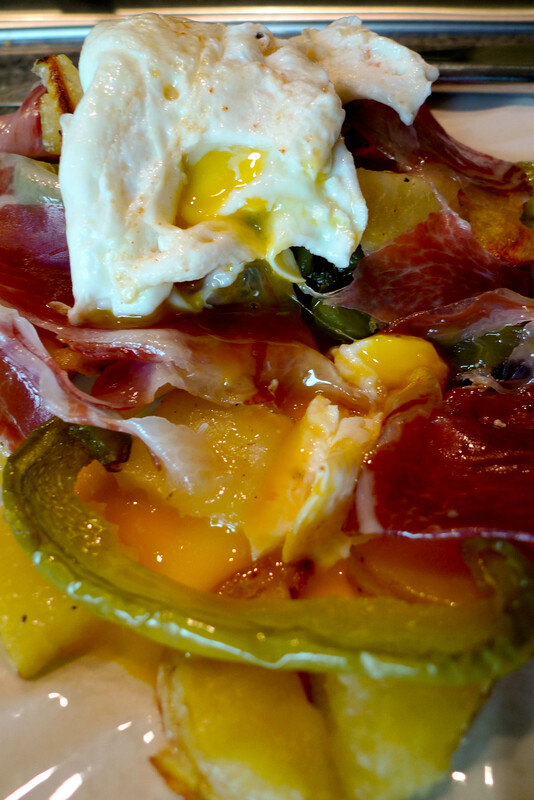 I like the idea of roasting the ingredients – when my boyfriend showed me the “original version” for huevos estrellados, with shine in his eyes, I thought oh no, fried stuff again. I actually never made it then, maybe he would like the roasted version as well? 🙂 We are talking about a Spanish man here! It’s worth a shot! As long as you use real jamón and play up using real Spanish olive oil, you should be ok in appeasing Spanish pride in their food…Buena suerte!